One of the biggest trends in fitness in the last several years has been HIIT, High-Intensity Interval Training. 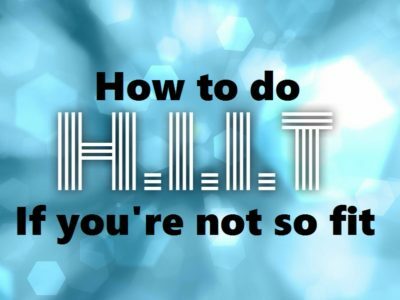 I know many people have been scared away by that name, so today I’m going to explain what exactly HIIT is, and why I think HIIT can be appropriate for absolutely anyone, even if you’re not so fit. First, let’s break down HIIT. High-Intensity means that you’ll be pushing yourself and working really, really hard. At Fitness with Rachel, you’d back off before you got to the “I’m going to puke or pass out, maybe both” stage. But generally speaking, High-Intensity means you’re working past your comfort zone a bit. Interval Training means you’ll be working in specifically timed increments, whether that’s minutes or seconds. You can vary your workload from hard to harder, hardest, or even recovery or rest. You can do a HIIT workout for either your Cardio, or Muscular Strength, but the best programs will work BOTH. That’s where the power of HIIT really is. It’s more than the sum of its parts. 1+1=3. Strength plus Speed equals Power. One of the biggest benefits to HIIT training is that, when done right, you’ll experience something called EPOC – Excess Post-exercise Oxygen Consumption. It’s more often referred to as “the afterburn”. It’s when you work in the anaerobic zone instead of the aerobic zone, and you create an energy deficit in your body that takes up to two days to fully recover from. All during that recovery time, up to 48 hours, you continue to burn calories! During a 4-minute period, working in this EPOC creation zone, you could burn 50 calories. Then, in the 48 hours hours following, you could burn an additional 250 calories! Now, you really have to work to get that much EPOC. It would very likely be the hardest work you’ve ever done during those 4 minutes, but the possibility is there. You don’t have to go to that extreme level though. You’ll still experience EPOC, just to a lesser degree, as long as you’re working that magic combo of Strength plus Speed. Because of how intense HIIT is, I think it’s best for the general public as a 30-minute workout, or even shorter. Any longer, and you won’t be able to work in the intensities needed for the most benefit, and your form can even start to go. Burpees quickly become slurpees. Another thing to consider with HIIT training is that everyone needs to be working at their own degrees of intensity. 10 seconds of squats at a hardest intensity will (and should) look very different for a 20-year-old college kid who’s on the track team, a 35-year-old post-pregnancy women, a 50-year-old man and a 75-year-old women. There’s no reason they couldn’t all do squats, but I would hate for them all to be in the same big group exercise class, trying to match the instructor and being yelled at to work their hardest. This is what makes Fitness with Rachel special. My Tabata Express classes are HIIT training, but groups are kept small, no more than 12 participants. While everyone is getting the same base workout, everyone is also getting modifications that are right for them. There’s no pressure or competition, and it’s up to you to decide what hard, harder and hardest looks like for you, at that moment. I’ll provide the gentle encouragement you need to get to the intensity that’s right for you. I’ll only stop you if I think you’re going to hurt yourself. That way, everyone can benefit from HIIT training – even those who are not so fit. If you still have questions, please comment below, or shoot me an email using the contact me page.